West Brom took another big step towards Premier League survival as Saido Berahino's strike proved enough to beat Champions League-chasing Southampton. 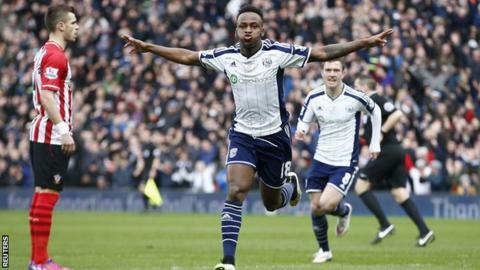 Berahino scored after just 71 seconds at The Hawthorns when he rifled in from Maya Yoshida's headed clearance. However, the 17-goal striker lasted just 10 minutes of the second half before going off injured. Graziano Pelle squandered Southampton's best chance when he failed to tap in Ryan Bertrand's excellent low cross. West Brom headed into the match with the same team that drew 0-0 at Sunderland after top-scorer Berahino passed a late fitness test to take his place up front alongside the club's record signing Brown Ideye, who had scored four goals in his last four games. That strike partnership has added a cutting edge to a Baggies side that has now recorded six clean sheets during a run of only one defeat in 10 games since manager Tony Pulis took control on 1 January. And when Chris Brunt's free-kick was only half-cleared by Yoshida, it was Berahino who was on hand to fire the rebound into the top corner from the edge of the box with barely a minute on the clock. Southampton responded with some tidy football but failed to test goalkeeper Ben Foster and, on 25 minutes, manager Ronald Koeman made a tactical change, bringing on Dutch winger Eljero Elia for Florin Gardos and switching to a back four formation. Saido Berahino has scored nine home Premier League goals this season; only Chelsea's Diego Costa has scored more with 10. Koeman began the match with three at the back in a changed 3-5-2 formation as he looked to shake up the team following last week's disappointing 2-0 defeat at home to Liverpool, which saw the Saints drop out of the top four. Sadio Mane was dropped to the bench for that Liverpool defeat after turning up late, but was restored to the side at The Hawthorns and provided the Saints' main threat in the first half - albeit firing over from long-range and then missing the target from inside the box. The Saints finished the half increasingly frustrated as both Koeman and the travelling fans accused West Brom of time-wasting. After the break, Ideye had the chance to extend the home side's lead on 53 minutes as he raced clear of the Saints defence but the Nigerian forward opted to cut inside instead of shooting and a combination of Jose Fonte and Yoshida snuffed out the chance. Southampton continued to toil but have struggled in front of goal of late - failing to score in their last three games - and when top-scorer Pelle failed to tap in Bertrand's cross from three yards on 68 minutes it was clear it would not be their day. Southampton failed to keep a clean against the Baggies for the first time in four league meetings. The only blemish for West Brom was Stephane Sessegnon's terrible dive in the box late on, for which he was booked. The win moves West Brom up to 13th, eight points clear of the relegation places, while Southampton, who have now won only one of their last five league matches, remain fifth, two points off fourth-placed Arsenal. "It was a goal that top, top class players score and Saido Berahino could be a top, top class player. Since I came into the club there has been no doubt about his ability, he just needs direction. He puts himself in good positions. He has that ability to play someone in or score. "We looked at the highlights and we probably had some of the best chances of the game. But they have got some very, very good players and in the second-half we had to defend for our lives. They changed it after 25 minutes as we were having so much joy and that made it difficult for us in the second half. "We have a weakness up front in terms of numbers. The last 15 or 20 minutes we have had to play Sessegnon up there. Brown Ideye and Saido were both carrying knocks even before the game. It just shows they have got good spirit in the dressing room and people want to play. "Saido had an injection before the game and maybe he should have one before every game, scoring goals like that. "Forty points will be safe this year without question. Some people take their foot off the pedal and this game is relentless so if you do that you get a kick up the backside." "We know the opposition of today. They play out of a very good defensive organisation, but they need points and they deserved the win. And for us it was too difficult to break down. "They scored a great goal and we complain more about our football today. We maybe had one or two chances to score a goal, but not more. "Maybe there is a little bit less confidence (for the strikers) but it is very difficult. We spoke about that before the game but then after one minute you are 1-0 down and everything changes. "We were looking for action (from the referee) over the throw-ins and free kicks. They took too much time. I think it was every time about 13 seconds and we spoke to the referee but they didn't do anything about that - maybe one yellow card. But that isn't the reason we lost. "The total performance of the team in quality is a little bit low from the beginning of the season but we have to go and believe in the next win. "Next Tuesday against Crystal Palace we have to win, as we need those points." Match ends, West Bromwich Albion 1, Southampton 0. Second Half ends, West Bromwich Albion 1, Southampton 0. Attempt missed. Eljero Elia (Southampton) left footed shot from the left side of the box is close, but misses to the left. Assisted by Jose Fonte with a headed pass. Ben Foster (West Bromwich Albion) wins a free kick in the defensive half. Foul by Eljero Elia (Southampton). Claudio Yacob (West Bromwich Albion) wins a free kick in the defensive half. Substitution, West Bromwich Albion. Chris Baird replaces Brown Ideye because of an injury. Foul by Nathaniel Clyne (Southampton). Youssuf Mulumbu (West Bromwich Albion) wins a free kick in the attacking half. Delay in match Brown Ideye (West Bromwich Albion) because of an injury. Attempt saved. Graziano Pellè (Southampton) left footed shot from the centre of the box is saved in the centre of the goal. Assisted by Morgan Schneiderlin with a headed pass. Stéphane Sessegnon (West Bromwich Albion) is shown the yellow card. Stéphane Sessegnon (West Bromwich Albion) has gone down, but that's a dive. Offside, Southampton. Morgan Schneiderlin tries a through ball, but Sadio Mané is caught offside. Attempt missed. Darren Fletcher (West Bromwich Albion) right footed shot from the centre of the box is too high following a set piece situation. Attempt blocked. Craig Dawson (West Bromwich Albion) right footed shot from the right side of the box is blocked. Assisted by Chris Brunt with a cross. Darren Fletcher (West Bromwich Albion) wins a free kick in the attacking half. Offside, Southampton. Sadio Mané tries a through ball, but Shane Long is caught offside. Attempt saved. Morgan Schneiderlin (Southampton) right footed shot from outside the box is saved in the bottom left corner. Sadio Mané (Southampton) wins a free kick in the attacking half. Foul by Craig Gardner (West Bromwich Albion). Substitution, Southampton. Shane Long replaces Dusan Tadic. Graziano Pellè (Southampton) wins a free kick in the attacking half. Hand ball by Brown Ideye (West Bromwich Albion). Substitution, West Bromwich Albion. Stéphane Sessegnon replaces James Morrison. Delay in match Claudio Yacob (West Bromwich Albion) because of an injury. Attempt missed. Jose Fonte (Southampton) header from the centre of the box misses to the right. Assisted by Morgan Schneiderlin with a cross following a corner. Corner, Southampton. Conceded by Chris Brunt. Offside, West Bromwich Albion. Ben Foster tries a through ball, but Brown Ideye is caught offside. Craig Gardner (West Bromwich Albion) wins a free kick in the defensive half.